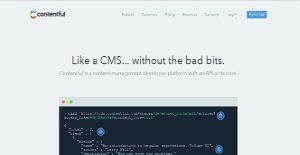 Contentful is an online content management system (CMS) and development platform that has API embedded at the core of its operating technology. This advanced system makes all created content accessible via APIs, which allows users to bring their content anywhere and showcase it for any purpose. With Contentful’s unique technology in place, users are able to build a custom content model instead of having to deal with fixed, predefined templates. It delivers all needed content while providing enough room for users to design around it, separating the content from presentation in a more flexible and scalable manner for better performance. On top of it, Contentful is a highly affordable and well-integrated content management solution which will blend seamlessly into the rest of your business’s software architecture. The vendor offers a free plan for starters, freelancers, and small businesses, and a painless transition towards higher, paid plans to support your brand’s development. Contentful’s content is stored in entries which consist of flexible and modular fields. This allows moving away from the page-centric model which is very limiting in terms of content presentation. It also has the advantage of using the “Markdown” formatting language which can work on various platforms and can quickly be parsed. With a capacity like that, content template of whatever type can be created, regardless of its complexity and whether you’re creating it manually in the web interface, or by using some specific code via the management API. Content management and content delivery are decoupled on the infrastructure level. This means that if the management segment fails, the delivery tier is still up. The delivery infrastructure is read-only for higher speed and better security, and access permissions are governed depending on your internal business structure and organization. Multiple redundancies and extensive caching ensure fast content delivery to users, and secure important data from getting lost in the system. This entails that in case that all redundancies on the delivery infrastructure fail, 98% of content would still be served just from the cache. Contentful also offers real-time document editing for proper collaboration. With its powerful API and custom scripts, content can be imported from almost every other source. Content and content models can be created and updated via the management API. That way you can implement your own custom content management workflow: Finally, Contentful also offers synchronization that enables delivery of small bits of content updates, greatly improving mobile bandwidth requirements. If you are interested in Contentful it could also be a good idea to investigate other subcategories of Best Content Management Software collected in our base of SaaS software reviews. Enterprises have different wants and requirements and no software solution can be perfect in such a situation. It is pointless to try to find an ideal out-of-the-box software product that meets all your business requirements. The smart thing to do would be to modify the solution for your specific requirements, staff member skill levels, finances, and other elements. For these reasons, do not hasten and pay for well-publicized popular solutions. Though these may be widely used, they may not be the best fit for your unique needs. Do your groundwork, investigate each short-listed application in detail, read a few Contentful reviews, call the vendor for clarifications, and finally select the app that presents what you want. How Much Does Contentful Cost? We realize that when you make a decision to buy Content Management Software it’s important not only to see how experts evaluate it in their reviews, but also to find out if the real people and companies that buy it are actually satisfied with the product. That’s why we’ve created our behavior-based Customer Satisfaction Algorithm™ that gathers customer reviews, comments and Contentful reviews across a wide range of social media sites. The data is then presented in an easy to digest form showing how many people had positive and negative experience with Contentful. With that information at hand you should be equipped to make an informed buying decision that you won’t regret. What are Contentful pricing details? What integrations are available for Contentful? If you need more information about Contentful or you simply have a question let us know what you need and we’ll forward your request directly to the vendor.